After a slew of first-time bracelet winners at this year's World Series of Poker, it was time for the old guard to strike back yesterday as Dutch Boyd and Eric Buchman (pictured) claimed gold. 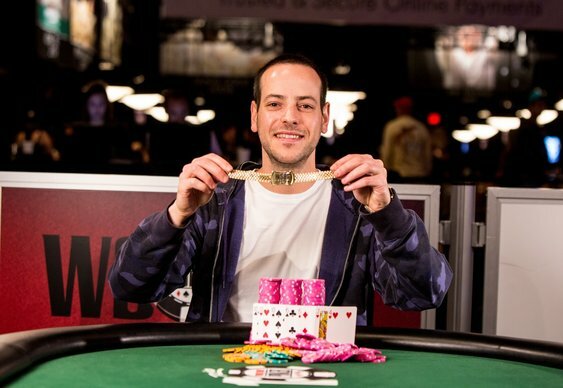 The controversial Boyd claimed his third WSOP title after besting a 1,688 runner field in event #33 $1,000 No Limit Hold'em. The 34-year-old defeated Steven Norden heads-up to take the first prize of $288,744, sealing the deal when he picked of Norden's king high bluff with top pair. After WSOP wins in 2006, 2010 and 2014 we'll be having a bet on another Boyd victory by the time the 2018 World Series comes along. It's been a good couple of days for the WSOP Main Event class of 2009. Winner Joe Cada won his second bracelet earlier this week and fourth place finisher Eric Buchman repeated the trick in the $1.5k Seven-Card-Stud. The New Yorker worked his way through a field of 345 runners before beating another November Niner, Alex Kravchenko, to the title. Buchman started two-handed play with the Russian with a two to one chip lead slowly ground his way to victory, before finishing him off after hitting a straight and full house in the final two hands. The 550 starters in the $5k Eight-handed NLHE have been whittled down to just 23 with Jeff Madsen leading the way. The three-time bracelet winner returns on 661, 000 followed by Jay Conley (592,000) and Brian Yoon (587,000). When the action resumes this evening, the British rail will be focused on Sam Trickett who finished day 2 in sixth place on 456,000. Other notables still in with a shot of taking the $633,341 first prize include Josh Arieh (385,000), Sylvain Loosli (285,000), Eric Froehlich (143,000), Dan Smith (138,000) and Olivier Busquet (118,000).